Heid is the Scots word for head, and inside these pages you’ll find fifteen fabulous heids to choose from. 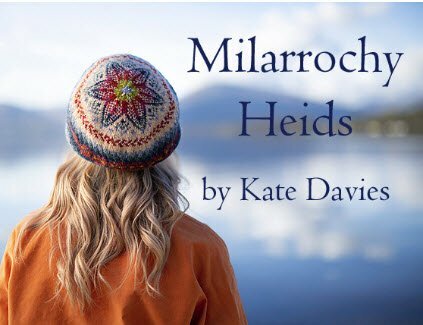 From Ute Vos’s simple stripes to Virginia Sattler-Reimer’s complex kaleidoscopic crown; from Felicity Ford’s exuberant Featherheid to Emily Williams’ stunning double-knitted Tarradale, the heids in these pages are as varied as their creators. Established designers such as Ella Gordon and Dianna Walla meet emerging talent like Justyna Haberkowa and Sarah Mackay, drawing creative inspiration from landscape and location, flora and fauna, childhood memory and medieval architecture. With an introduction by Kate, and stunning photography around Loch Lomond by Tom Barr, this book is sure to bring you a warm and happy heid.